“The whole world opened…” Sumter County Museum Presents Bethune Retrospective | Sumter…In the Middle of Everything! The Sumter County Museum and Morris College are proud to present Mary McLeod Bethune: From Mayesville to National Hero at the Heritage Education Center’s Ross S. McKenzie Hall, starting November 15, 2013. The exhibit opens with a reception from 6 to 7:30 p.m., with Dr. Jacob E. Butler of Morris College scheduled to speak at 6:15 p.m. on the life and legacy of this truly phenomenal woman. “Phenomenal” is a strong word, but somehow, it feels almost woefully inadequate when discussing the life of Dr. Bethune. Her rise from the Mayesville cotton fields to the White House—and beyond—is a remarkable tale, one that we have discussed here previously. What can one say of a woman born into a family of former slaves, whose drive for excellence blazed a trail all the way to…Venus? The Museum’s Heritage Education Center showcases a visual history of Mary McLeod Bethune, who overcame poverty and other obstacles to emerge as a champion of civil rights and educational opportunities for African-Americans. Admission is free; light refreshments will be served. The Sumter County Museum is located at 122 North Washington Street, with parking available at the Church Street entrance. For more information, please call (803) 775-0908 or e-mail info@sumtercountymuseum.org. Or, visit the Museum on the Web at www.sumtercountymuseum.org. If you are already acquainted with the life and work of Dr. Bethune, this is a great opportunity to get a better sense of what she was like in action (although really, I think she probably had to be seen to be believed). If her name and face are not familiar to you, prepare to say, “Oh, I have seen her before!” as you reflect on the life and times of this fascinating woman, who was among the first from Sumter District to leave her mark on not just our nation, but on our world. This exhibit is sponsored by Morris College. 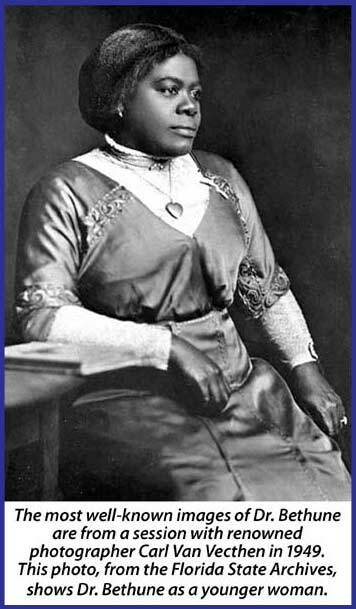 This entry was posted in Sumter, South Carolina, Visit Sumter SC and tagged African-American, history, Mary McLeod Bethune, Mayesville, Morris College, museum, South Carolina, Sumter, Sumter County, Sumter County Museum. Bookmark the permalink.